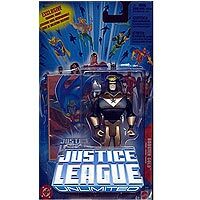 This series of 4.5", 5 points of articulation figures was released by Mattel featuring characters appearing in the Justice League Unlimited television show. 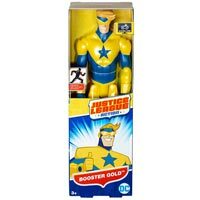 Booster Gold was released as part of the second series as both an individual figure (with Skeets) and as part of a 3-pack with Superman and Martian Manhunter. 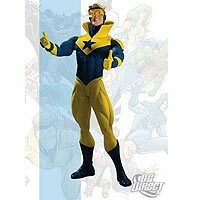 Booster's JLU figure deviates greatly in costume design (inexplicably colored metallic gold and black) both from his comic book and his television appearances. Minimates brand 2" figures have been produced featuring a number of popular culture figures since the line was introduced in 2002. 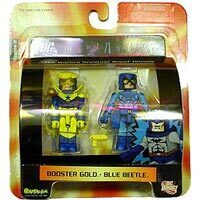 It's only fitting that the series of DC Direct's 2-packs feature a tandem of Booster Gold and Blue Beetle II (with 14 points of articulation). Accessories in the 2-pack include Skeets and Beetle's BB gun. 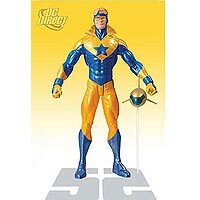 Much more loyal to the original character than the Justice League Unlimited figures, DC Direct's 6.75" Booster Gold figure was released among the first wave of the line of figures in the series titled after the comic series 52. The Booster Gold figure includes Skeets. A figure of the heroic Supernova was also released in the 52 figure series. 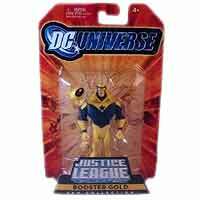 The 4.5" Booster Gold figure originally released in Mattel's Justice League Unlimited series was re-released in the Justice League Unlimited Fan Collection series. This figure had a color-corrected costume to match the yellow and blue suit he wore in the television series. Like the previous release, this figure can be found sold as an individual figure (with a color-corrected Skeets) sold exclusively through Target stores, and later as part of a 3-pack (with Blue Beetle and Fire), sold exclusively through MattyCollector.com. 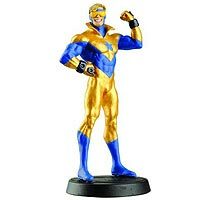 Booster Gold is among the figures in Mattel's 6-inch DC Universe figures. There are two, slightly-different versions of this figure: Classic (Mark I power-suit with collar) and the rarer Modern (Mark IB power-suit without-collar and with miscolored gloves). Both include an accessory of Skeets II, though the the Modern costumed variant opens to reveal a small Mr. Mind inside. 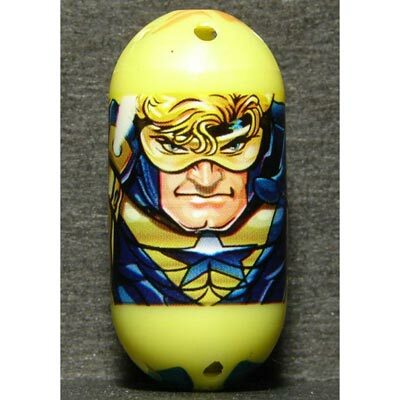 This includes a 6.75" Booster Gold figure modeled on art by series artist Kevin Maguire. Beginning in 2008, Eaglemoss Publishing Group LTD of the United Kingdom began publishing the DC Comics Super Hero Collection, a monthly 20-page magazine shipped with a licensed DC character. Each figurine is cast in lead and hand-painted. 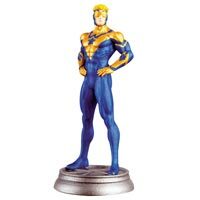 The Booster Gold figurine, number 20 in the series, was released in September 2009, is approximately 4" tall, and weighs approximately 4 pounds. The accompanying magazine includes an extensive, illustrated biography of Booster Gold, his adventures, his friends, and his enemies. 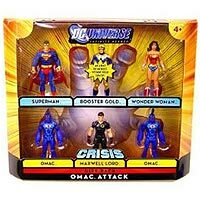 The first ever 3-3/4" scale Booster Gold figure is included in the DC Universe Infinite Heroes Omac Attack 6-pack from Mattel. The 3-3/4" figure comes without any accessories in his modern Mark IB power-suit. Other figures in this six pack are Maxwell Lord, OMACs, Superman, and Wonder Woman. This 6-pack of figures was released exclusively through Wal-Mart stores in late 2010. Australia-based Moose Enterprises added a DC Comics license to their extensive line of unique Mighty Beanz toy figures in early 2011. 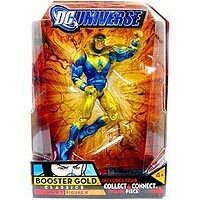 Booster Gold is figure number 12 of 54 in DC Universe Series 1. Eaglemoss Publishing Group LTD of the United Kingdom continued their successful line of DC Chess Collection in 2014 with the inclusion of Booster Gold in his New 52 costume. Like the previous Figurine Collection Magazine, the DC Chess Collection is a bi-monthly release of a single chess piece with an accompanying magazine. Each figurine is cast in "metallic resin" and hand-painted. The Booster Gold "white pawn" figurine, number 61 in the series of Justice League and villains pieces, was released in 2014. 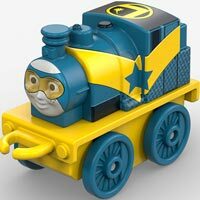 Among the stranger Booster Gold figures is the Booster Gold variant of the character Dash appearing in the Thomas & Friends Minis miniature trains released by Fisher-Price. Based on characters originating in the Thomas the Tank Engine television show, these toys included a line of Thomas characters dressed as DC Super Friends. Booster Gold joined his best friend Blue Beetle in a Previews Exclusive two-pack of Funko Pop! figures. The pair came in both standard and metallic versions available only to comic specialty stores late in 2017. Mattel made 12-inch action figures of many characters appearing in the Justice League Action television show beginning early 2017. 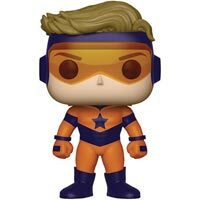 Although early indications were that Booster Gold would be included in the line, the figure didn't actually appear in stores until late in the year (apparently via the Canada market).